The US median age is now about 38, and border apprehensions are at their lowest levels since the early 1970s. So there's probably less unauthorized border crossing now than ever before in the lifetimes of a majority of US citizens. And they call this a border crisis! A few notes: Apprehension figures don’t necessarily tell us how many people crossed the border without authorization; they may just reflect how many resources have been put into apprehending them. 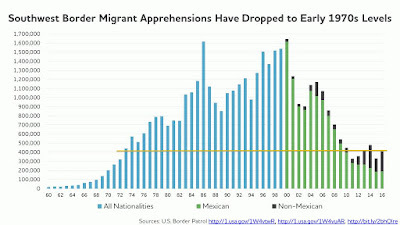 There are now some 20,000 Border Patrol agents, more than five times the number in the early 1970s, so it’s possible that the agents are apprehending a higher percentage of the crossers—which would mean that border crossing 45 years ago was actually greater than now. And we need to remember that apprehensions don’t account for people crossing the other way. 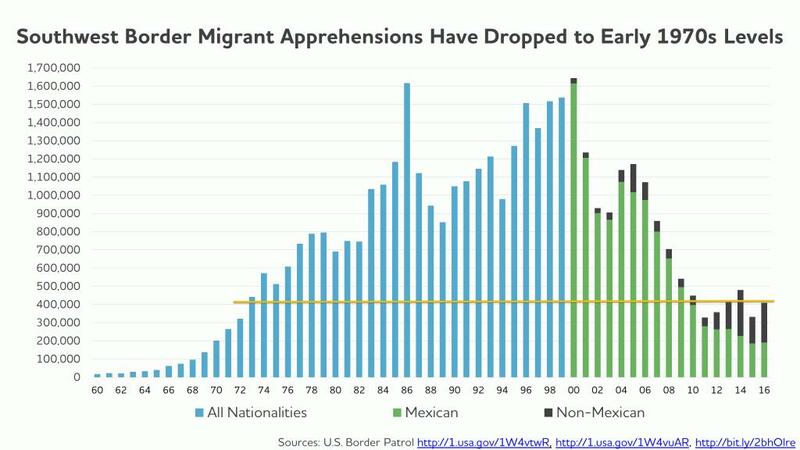 Estimates of the undocumented population have remained stable—around 11 million—for nearly a decade, which indicates that some immigrants are heading back home at the same rate that others are coming here. The Politics of Immigration: Questions and Answers is a book that goes beyond soundbites to tackle concerns about immigration in straightforward language and an accessible question-and-answer format. For immigrants and supporters, the book is a useful tool to confront stereotypes and disinformation. For those who are undecided about immigration, it lays out the facts and clear reasoning they need to develop an informed opinion. Ideal for classroom use, the updated and expanded 2017 edition provides a succinct overview of U.S. immigration history, policy, and practice, with detailed notes guiding readers toward further exploration. Guskin and Wilson have written extensively on immigration and facilitated dozens of dialogues on the topic with students, community activists, congregations, and other public audiences. To arrange a dialogue or for more information, contact them at thepoliticsofimmigration@gmail.com. To stay in the loop on author events and related resources, follow the book on Twitter (@Immigration_QA) and Facebook (https://www.facebook.com/ImmigrationQA/).